Born in St. Petersburg, Jean Béraud moved to Paris upon the death of his father, Jean Béraud. He attended the Lycée Bonaparte and subsequently studied law until 1870. He was part of a mobile unit defending Paris against the Prussians during the Franco-Prussian War in the winter of 1870-1871. 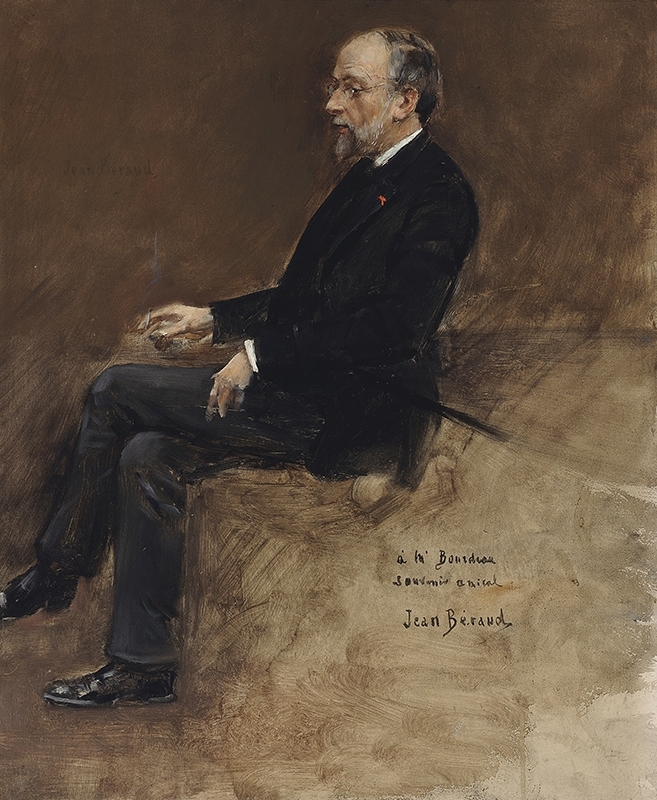 Abandoning his previous ambitions to become a lawyer, Jean Béraud joined Parisian artistic circles and studied portraiture with Léon Bonnat (1833–1922), a leading artist of the Third Republic. Many of Béraud's well-known contemporaries also passed through Bonnat's studio, including Gustave Caillebotte (1848–1894), Alfred Roll (1846–1919) and Henri Toulouse-Lautrec (1864–1901). While Béraud initially emulated his master's choice of subject and painted portraits of women and children as well as genre scenes, he was quickly drawn to representing modern urban life and developed his own inimitable style. He made his Salon debut in 1873. Béraud was a founder of the Société Nationale des Beaux-Arts, with whom he exhibited from 1910 to 1929. He was a member of the Salon des Artistes Français, winning third prize at the Salon of 1882, second prize in 1883 and a gold medal in 1889. He later became a member of the jury, and was thus ranked hors concours. He won a gold medal at the Paris Exposition Universelle of 1889, and was made an Officer of the Légion d'Honneur. Béraud's images of Parisian life and affection for Parisians granted him notoriety and popularity; Marcel Proust described him as "a charming creature, sought in vain, by every social circle" and he was alleged to be a perfect gentleman, impeccably dressed and above trends and fashion (Offenstadt, 7). Béraud was the perfect flâneur in every sense of Baudelaire’s characterization of the word, and "a passionate spectator whom we might liken to a mirror as vast as the crowd itself" (Steele, 90). He was intrigued by all aspects of la vie parisienne, and was one of its most scrupulous and devoted observers. He once wrote to Alfred Roll, "I find everything but Paris wearisome" (Offenstadt, 14). Béraud was particularly fond of capturing the effects of the elements on the various mondaines of Paris, and he is known for his meticulous renderings of Parisian street scenes. Belle Époque journalist Paul Hourie wrote: “When you paint scenes from everyday life, you have to place them in their context and give them their authentic setting. This means that, in order to be sincere, you have to photograph them on the spot, and forget about the conventions of the studio. As a result, Jean Béraud has the strangest life imaginable. He spends all of this time in carriages. It is not unusual to see a cab parked on a corner of a street for hours on end, with an artist sitting inside, firing off rapid sketches” (Offenstadt, 9). In 1889, a Danish visitor in Paris remarked that the city’s boulevards were "the great rendezvous where the whole population flocks together to satisfy its great craving for sociability, where people meet with the wish of being together, and associate with the amiable courtesy and easy approach that is a consequence of the consciousness of being mutually entertaining" (Kaufmann, 73). The new shops, cafés, and entertainments of Belle Époque Paris inspired an entirely new culture: life was now lived in public (Mancoff, 8). The opulent spectacle of the newly created public spaces of Paris became Béraud's choice subjects, including the city’s interior spaces of Paris, such as cafés, ballrooms, theaters, casinos and, rarely, private apartments. Béraud’s picture La Conversation reflects his interest in the increasingly blurred boundaries of public and private in the city and the balcony had become emblematic of this shift. A ubiquitous architectural feature of the apartments in Haussmann’s Paris, the balcony was an extension of the home as well as a connection to the street, and was thus an indeterminate, simultaneously private and public space (Van Zanten, 154-8). This ambiguous space became a potent device for artists to explore, a most notable example being a painting by Édouard Manet (1832–1883), Le Balcon (1868-9, Musée d’Orsay, Paris) in which he depicts the artist Berthe Morisot (1841–1895) and violinist Fanny Claus (b. 1849) looking out from a balcony. Béraud enjoyed widespread critical success, excepting his images of Christ in contemporary settings, which were the object of considerable public curiosity and critical outrage in 1890. Béraud’s distinctive works make him perhaps the quintessential chronicler of modern Parisian life in the last two decades of the nineteenth century. The limited color palette he utilized for many of his scenes from daily life and his ambitious formal and figural choices allow art historians to place Béraud alongside other Impressionist artists of the time, who also sought to portray the changing character la vie moderne in nineteenth-century Paris. Currently there are no available Jean Béraud paintings for sale at the Mark Murray Gallery. Please contact us if you are interested in selling your Jean Béraud paintings or other artwork from the 19th century and early 20th century.